"The Grinder in 10 Words"
"The Comic Minds Behind Mulaney"
CHECK OUT THE WINNING SPOTS! 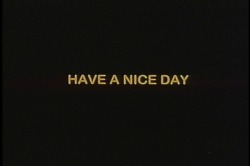 An old man once stopped me on a busy street and said, "Have a nice day." The way he delivered this social nicety was genuine and heartfelt -- and what better way to explore true meanings behind social niceties than in a mock-documentary.